Public Beaches in Kill Devil Hills | Find your spot! 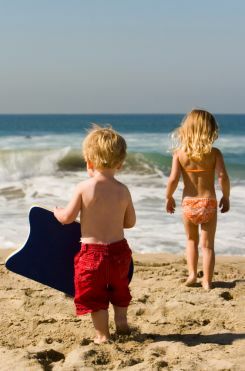 A day on the beach in Kill Devil Hills, NC is all about classic family fun! Kill Devil Hills offers wide beaches, white sand, and plentiful public beach accesses. Many Kill Devil Hills beach accesses provide ample parking, showers, and restrooms. The beaches are typically bustling during the summer months - you'll find vacationers boogie boarding, skim boarding, playing beach volleyball, building sandcastles, reading, and lounging. Pack a cooler with sandwiches and snacks, or simply walk to a restaurant or sandwich shop for lunch. Kill Devil Hills, NC beaches are patrolled by the Town of Kill Devil Hills Ocean Rescue Division. Lifeguards cover all oceanfront areas by ATVs and 4-wheel drive trucks. Kill Devil Hills also offers numerous fixed lifeguard stands (see complete list below). Kill Devil Hills lifeguards are on duty from 10:00 am to 5:30 pm daily during the summer months. Please be sure to carefully read all Outer Banks Beach & Ocean Safety Guidelines before hitting the Kill Devil Hills beaches. Play hard, but be sure to play it safe! Additionally, don't forget to reapply sunscreen and drink plenty of water while on the beach in Kill Devil Hills, NC. Bonfires are prohibited on Kill Devil Hills beaches. Fireworks are prohibited on the Outer Banks. Between Memorial Day and Labor Day, dogs are not permitted on Kill Devil Hills public beach between the hours of 9:00 am and 6:00 pm (service animals are an exception). At all other times, dogs must be on a leash and under the control of the handler. Beach wheelchairs are available on a first-come, first-served basis for use within the Town of Kill Devil Hills limits. Paperwork must be filled out at the Kill Devil Hills Fire Department located at 1634 North Croatan Highway (beside the Dare Centre).